Serves two very hungry people as a starter. Or four lettuce-leaf eaters. Since I first started making humous, I’ve discovered that tinned chick peas have a *lot* of salt, so if you have a pressure cooker, soaking and cooking is fairly easy (and much cheaper). You need to soak the chickpeas in water for a minimum of 7 hours – I tend to do this before I go to bed, and then cook in the morning. Put the chickpeas in the pressure cooker, just cover with water, and cook for 25 minutes. Drain off the water and reserve for the humous. If you do buy tinned, personally, I resent paying 59p for a tin of chick peas in Sainsbury's: go to your local ethnic food type shop, and they'll be 20p. You can also get the tahina there, which is often called tahini... the light sort is nicer for this. Also, these are just proportions. I make up to four times this amount at once in my Magimix. Put the garlic clove in the blender, until it's finely chopped. Put all the chick peas, apart from a handful, in the blender and blend. You want it to be slightly thicker consistency than the final desired one - add a little of the cooking liquid if you need it. Put in a tablespoon of tahina - more or less, depending on how you like it. Pour in some lemon juice, to taste... a more greek humous has a lot of lemon. I occasionally use lime juice, also. Pour in some olive oil (gives a richer flavour, I don't always do this), to taste. About a couple of tablespoons, or however you like it. Salt and pepper to taste; make sure you taste the humous - it's the only way. 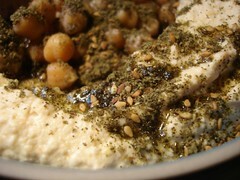 I like to serve in a small bowl, scooping out a hollow in the middle, and put the reserved handful of chickpeas there. Pour over some olive oil, some toasted pine nuts, and sprinkle with Za’atar if desired. After years of burning them under the grill, I discovered from a Sefardi friend that the secret is to cook them in their own inherent oil in a small pan on a light flame. Watch them, though; they’re never great burned. Za’atar is a sumac-based middle eastern herb mixture that you can buy from Seasoned Pioneers, or in a Lebanese shop, if you live in Kilburn. Don't just buy sumac, it's the blend that makes the difference. Personally, I get mine sent from a friend in Israel.